Ah, guacamole. If I’m eating guacamole, I’m eating some version of Mexican food or Tex-Mex and that means I am a happy girl. Sadly, South Korea is a little bit lacking in the Mexican food department (I know, I know – you don’t come to Korea for the Mexican food), although I hear that there are a few notable exceptions for Mexican food restaurants in the foodie districts in Seoul. At least avocados are readily available at my local Costco. So, I decided to make my own guacamole at home. When I realized how easily you can make this healthy dip with only a handful of ingredients, I just had to share this recipe with you! I really do love avocados. They’re such a unique fruit (did you know they were a fruit? Sometimes their green colour and lack of sweetness cause people to lump them in the “vegetable” category). Their high content of (healthy!) fat makes them infinitely spreadable (on toast, on burgers, on anything you want, including your face – avocado features in many at-home facial masks! That’s your excuse next time you go overboard on Nacho Night and dive face-first into the platter) and is what features in authentic guacamole. And I realized that many people have only ever experienced avocado in the guacamole form (because they haven’t made my Mint Chocolate Avocado Protein Pudding – but should try, obviously!). 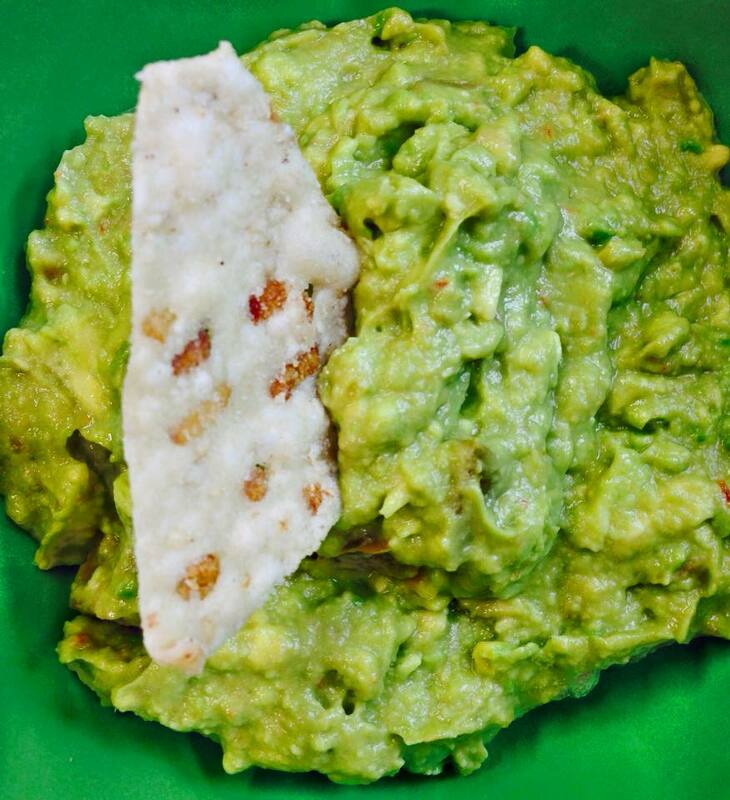 But, if you’ve only ever eaten commercially-prepared guacamole, you could be missing out! I didn’t even know this when I set out to make my own guac, but some brands actually contain less than 2% avocado and contain a bunch of other weird “crap” and artificial colours and flavours (Brands of Guacamole You May Want to Avoid). So if there’s barely any avocado, then there’s barely any of its health benefits, such as potassium, fiber, vitamin E and lutein (the latter two are helpful for healthy skin and hair and eyesight, respectively). Needless to say, this recipe is NOT short on avocado – it’s the star of the show, and the other four (!) ingredients are merely seasonings, really. As per usual, I’m also all about making recipes as quick and easy to prepare as possible. Even though I love to cook and bake and spend time in the kitchen, I want to be as efficient as possible and make the most of the time I do spend there. A quick and easy ingredient in this recipe is pre-bottled (or jarred, as the case may be) salsa. You could, as always, make your own at-home version, and either way, YOU determine how much heat you can handle. I used Pace Original Picante Sauce Medium (P.S. – this recipe carries a “paleo” label but you’ll want to carefully check the ingredients on your salsa label to ensure they are Paleo-friendly, depending on how strictly you are adhering to the Paleo diet). Since there’s just one heaping tablespoon in the recipe, the resulting guacamole was flavourful but not too spicy – the Golden Graham Boy gobbled it up at lunch today. 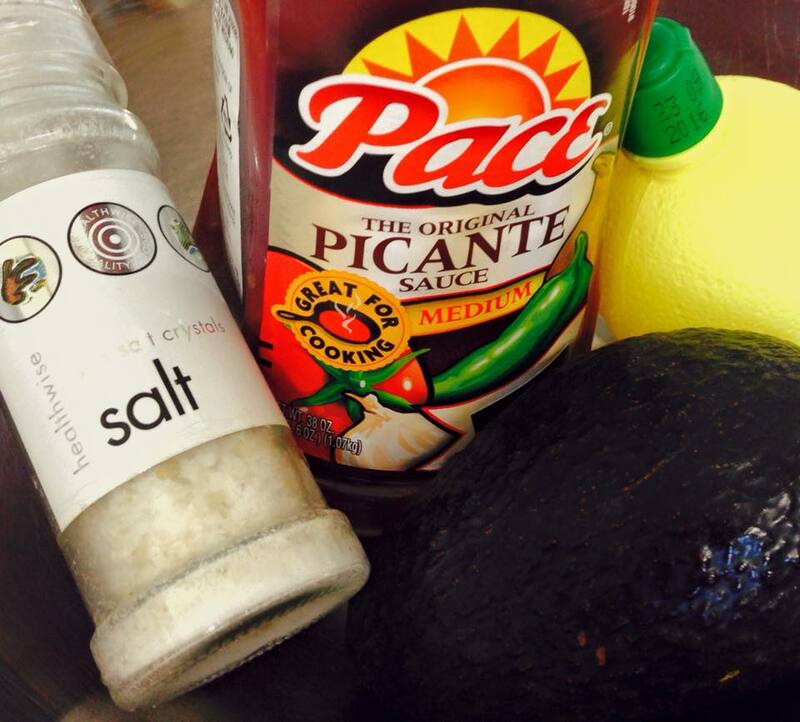 Avocado, lemon juice, salsa, sea salt and garlic (not pictured) – everything you need to make delicious guacamole at home! Since we’ve already talked about two of the ingredients, there are only three ingredients left: chopped garlic (fresh or bottled), lemon juice (fresh or bottled), and sea salt to suit your taste. Consider that you can prepare this with just a fork and a bowl (no food processor needed!) 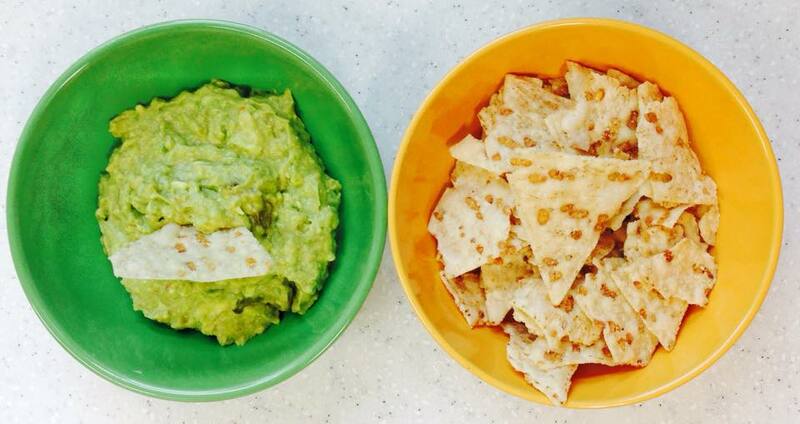 and there’s no excuse for NOT making your own at-home, restaurant-quality guacamole. You’ll never look at avocados the same way again! No need for a food processor – just a fork will do! Creamy, cool avocado gets kicked up with zesty lemon juice, spices and garlic for this classic Mexican food dip. 1. 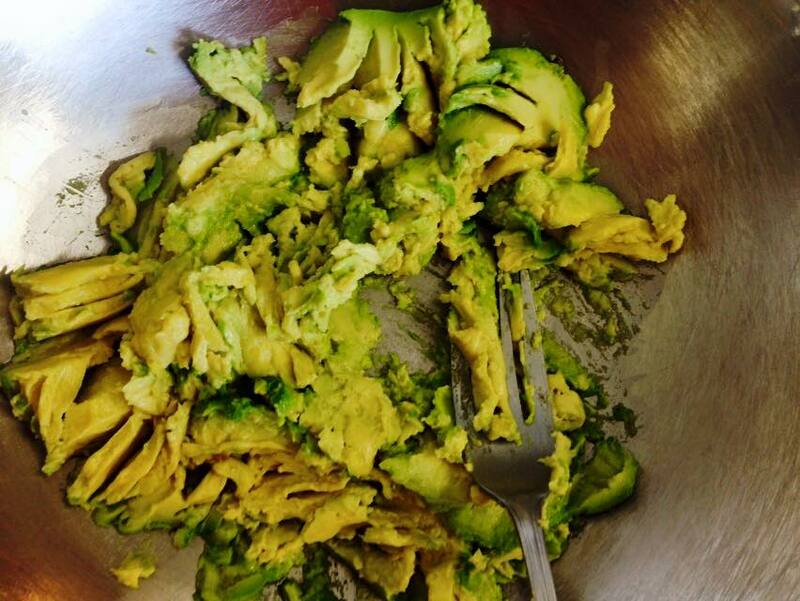 Remove the skin and pit from the avocado and mash with a fork until only small lumps remain – no need for a food processor! 3. Stir with fork until all ingredients are fully combined, scraping down sides with a rubber spatula as necessary. 4. Add sea salt, to taste, and serve immediately or refrigerate in a covered container. Serve with your favourite tortilla chips or as a spread for nachos, burritos, enchiladas, burgers, etc. This is a great side for my Simple Southwestern Chicken Skillet. 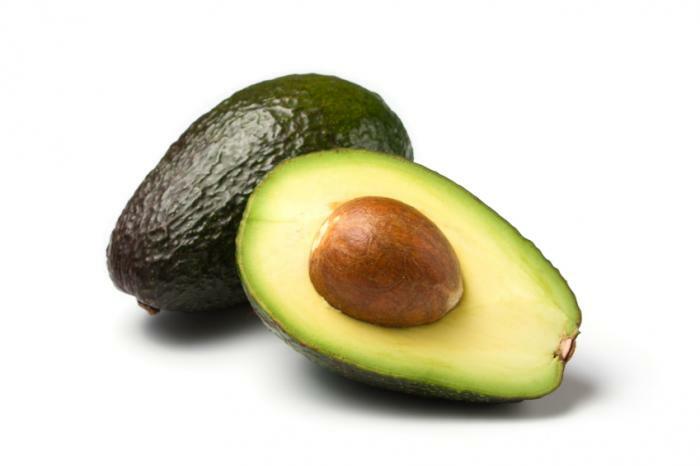 Can be kept in the fridge in a covered container for 2-3 days (discoloration of the guacamole is normal and does not mean it has spoiled – stir briskly to “revive.” If in doubt, throw it out! ).